Bulgaria : Orfeus Oreus, 1972, no f-holes, prototype? Very heavy: 3,75 kg! The Netherlands : Egmond Astra .. or Astra by Egmond? Welcome to "lordbizarre's electric guitar & amp museum" situated in Wange, Belgium, €pe. Already 351 electric guitars & 50 amp's; ... and still growing! It all started in 1968, when I made my first 'electric' guitar out of cardboard and poplar (for the body) and oak... for the arm. Since I hadn't the money for the frets I made them of flattened 2,5 mm² electrical wire. Unfortunately, the measures I took from a friend's guitar weren't correct: so the guitar was only playable until the 5th fret. After a few months I bought a Fuji post order guitar from a friend and learned to play for real. I finished my school as an electro-technician and after several years I started repairing old Juke-Box valve amplifiers as a hobby. 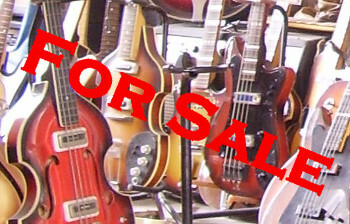 In 1995 I found a Gibson SG for a very reasonable price; had the money from all those years amp-repair and bought it! A few weeks later an Ibanez RocketRoll II; one month later a Framus Hollywood (with sliding pu)....and yes: the collection started. I already had some old amplifiers (such as Schaller KV50ST; Dynacord DA20; etc...) so the amp-line was also already there! Nothing can't stop me now! I'm trying to give as much info as possible, but feel free to mail me with more, so all info can be as accurate as possible! Therefore: thanks! OK, enough words, let the tour begin..!.. This is the one, number one !! I made it in 1969. It's made of several layers of carton wood, glued on a poplar body. The arm is made out of an oak beam, which I saw manually at the right size. The frets (I hadn't the money to buy new fret wire...) are made of flattened 2,5 mm² copper electricity wire. As you can see Ibanez (Jem series/Satriani...I believe) wasn't the first to use wood screws as marking dots ! Since I hadn't the money for the perloid I used this easy solution. The problem with the frets were that you only can play up to the 5th fret, 'cause I probably took the wrong dimensions on a friends guitar. As pick-up I used a telephone mike, which I amplified through a Emmerson FM radio,with a self made distortion... that's what I call distortion ! The "guitar" even had a tremolo bar, but to change the strings one had to unscrew the protection plate ! The external wiring was made of an old automobile radio-antenna cable. Like the Dutch Egmond Super Solid 7 with tremolo this trem only worked "up",couldn't get lower. A nice example of old 1963 Kawai's who where sold in the late 60's and early 70's as postal order guitars. I've some indications that these guitars (simple version) where sold under the "Shadow" brand. I've them in different kinds: bolt-on necks with different thickness and different lenghts of necks. Also with different neck plates. left: de luxe version S-80T (sparkle gold, two pu's and tremolo)... and shining on stage as an asteroid!!! A very lucky strike, only happens once in a lifetime: a Wandré "Spazial" and a Davoli "DTC-44C Blue Jeans" valve combo (ECL82). Wandré and Davoli worked together in the 60's and both produced special design musical items. I've a few Davoli's such as the "8036-P" Davoli / Krundaal (duo EL34) and the organ&bass "A.Or.ba.ch B6" Davoli / Krundaal (duo EL504). Seems to me that Krundaal ran also an amplifier chain, 'cause I've a "Storm 50", a solid state amp from the 70's, although a very vintage look! Another problem ... which guitar is this? No brand, no original keys, but at least in reasonable shape. Eye-strucking is the chrome pick guard and the rather large headstock. On the back is only indicated "EG-35". It seems that the headstock indicates a Guyatone, but the two switches indicate Teisco ... who will tell? To determine which brands the No Names had one must sometimes completely take the guitar apart and take note of every detail on every piece. Here for instance the pot meters (Daïto and Cosmos). Then the biggest problem is to find another guitar with the same hardware, but with it's brand name. Even with this very special heel plate with 5 screw holes I still didn't find out which brand and / or factory build this guitar!